Our radio code recovery service covers the many Radios & Carminat Sat Nav systems fitted to RENAULT cars, vans & trucks. We aim to respond by email usually within an hour, a little longer at weekends. These codes are at our standard price of £7.95. After submitting the form, you will be forwarded to our payments page. Note that your request will not be actioned until payment is received. Our service is inexpensive but it is not free. We aim to give a good service to paying customers, with the assurance of our money-back guarantee: If we are not able to supply the factory-set code for your unit, we'll explain why and offer you some options, and we promise to refund you, less just a small 45p transaction fee. You will need to make a note of the numbers on the rear of the radio. Forked 'keys' will be needed to extract the radio from the dashboard - don't be tempted to try removing the radio any other way or to force it as you may damage the surrounding trim. The keys make it easy - you can find them in motoring stores or online. This independent website provides useful guidance on how to remove car radios and sat-nav units from vehicles. BE7412: The optional 6-disc CD changer sometimes fitted along with the BE7412 requires a second unlock code (2 codes need to be entered in the radio). We will supply both codes for the price of one. We'll need both sets of numbers from the radio and CD changer - look for the barcode numbers similar to 8200071208TL613. In most cases with Renault you will need to use the stereo system's steering wheel controls to enter the code we supply. Locate this or a similarly marked button on the steering wheel stalk control (see the photos - the stalks vary from car to car but Renault use the same button icon). 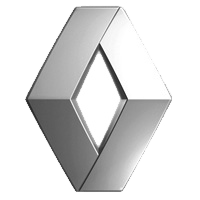 You will find code entry advice here (this refers to information on a particular radio but the process is common to most models in Renault). Some radios vary from this, requiring you to use the station presets on the radio to enter the code. This will be explained in the radio user manual but ask if you need help.